The musical odyssey of congera and batalera Carolyn Brandy began conventionally enough with piano at age six and violin three years later. She first encountered conga drumming and related percussion in the streets and parks while attending the University of Washington in Seattle during the late '60s, a period of "cultural revolution" on the West Coast of the U.S.
Carolyn spent the next few years on Orcas Island (between Victoria, BC, and Bellingham, WA), which is where she began drumming (in a style which she modestly describes as "unschooled and chaotic"), and carving and skinning her own drums. A couple of years later, she began formal instruction, not only learning to play the conga, but also learning the African culture and its music from which gave birth to such drumming. 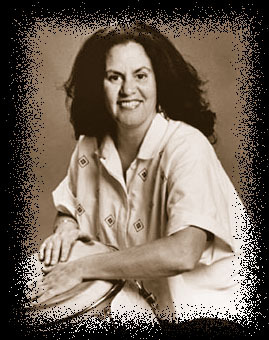 In the mid-'70s, Carolyn relocated to the Bay Area to study Cuban drumming with Marcus Gordon. Via the many contacts she made, she co-founded the women's quintet Alive!, with which she toured for six months per year for almost a decade. Alive! was not only of its time, but remains alive over 30 years later, regularly reforming for concerts and releasing a "best-of" CD from the various vinyl records. Since leaving Alive! in the early '80s, Carolyn has been very much involved in education, be it privately, or as part of Rhythmic Concepts' Jazz Camp West, or in the public schools, or even in prisons. Her students have been predominantly women: she feels strongly that there is something special about women playing drums, and thus overcoming centuries of taboo. Over the intervening quarter-century, Carolyn has had her strong percussionist's fingers in many pies. She formed the women's percussion band, Sistah Boom, which at one time had over 100 members. She completed a degree in music. She received a number of commissions, most notably one, supported by the Rockefeller Foundation, to develop "Skin Talk: Heartbeat of the Ancestors", intended to draw attention to accomplished women drummers and other musicians in the U.S., and to tell their stories via drumming, music, poetry and dance. (Carolyn's original music from "Heartbeat of the Ancestors" was included on her 1995 CD, "Skin Talk".) She has studied the bata (a religious drum used in the Yoruba religion that was transplanted from Nigeria to Cuba during slavery), an instrument that was once the exclusive province of men. And she has led several trips to Cuba to study Folkloric music and dance, organizing workshops all over the island, and studying with the Cuban masters of Afro-Cuban drumming and dance. Carolyn summarizes her philosophy in her advice to young drummers: (1) study, study, study; (2) respect, respect, respect; (3) give back, give back, give back. As she herself puts it, "I feel strongly that part of the mission of my life has been to bring people together, and to be one of the pioneers in breaking taboos that have shackled women for centuries." Book "How to Survive on a Desert Island for Dummies"